I first met Thom Whiddett and Luke Sweeney through a very dashing friend of mine, JC. That’s him modelling Thom Sweeney tailoring, above. I can see why JC likes the style; it is very him: sharp, sleek, close and with a readiness for experimentation. Lapels are often high; a signature piece is the U-shaped waistcoat with a deep drop in the front (pictured top). Their look is contemporary and has received a lot of deserved attention. Having now been a few times to see Thom and Luke, the thing that stays with me is their attractive little shop. First, it’s about 20 yards from Bond Street tube station – if you use the right exit. Which is convenient. Second, it is decorated with great taste and a clear fondness for iconic photography. You can tell it used to be an art gallery. And third, most importantly, I feel it is going through a pleasant process of growing into itself. On the ground floor are two showrooms, a fitting room and Thom’s board (above). Downstairs is another board and four or five tailors – the usual mix of trendy apprentices and a master tailor of southern European extraction, who has worked for them all. Up a winding staircase are Thom and Luke’s offices, which are in the process of being refurbished to create more space and accommodate another cutting board. It doesn’t yet have the worn-in elegance of Timothy Everest’s atelier in Shoreditch (where Thom and Luke used to work), or the rock n’ roll edge of Tom Baker’s backroom in Soho. But it has personality and promise – and very few new-build tailor shops achieve that. You can follow the discussion on Thom Sweeney: settling in nicely by entering your email address in the box below. You will then receive an email every time a new comment is added. These will also contain a link to a page where you can stop the alerts, and remove all of your related data from the site. Thanks for the post. 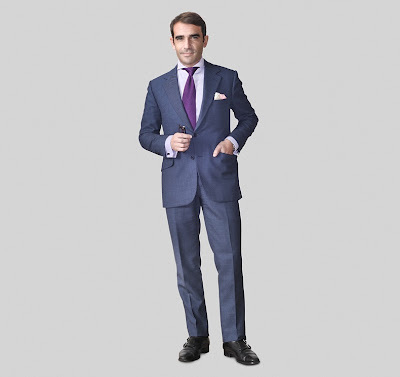 I’ve recently been thinking of getting a MTM suit from Thom Sweeney – I have seen a few articles on them and I really like their look/style. Do you, or your friend, have any comments/thoughts/recommendations etc on the finished articles? I’m having something made bespoke, but I don’t have any experience of the MTM I’m afraid. I’ll ask around. May I ask what you will be having comissioned Simon? 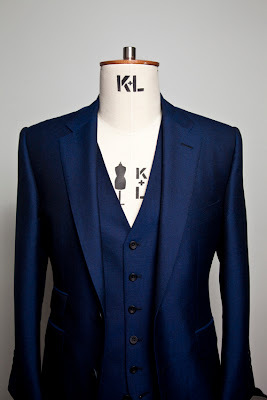 I would be very interested to hear your thoughts on the product and aesthetic versus that of perhaps more traditional tailors (norton and sons etc). I have 2 MTM suits, and they are wonderful – one is in 10oz flannel, the other in fresco, and both are softly constructed, and nicely nipped in at the waist. Super, super comfortable, and I receive unsolicited compliments every time I put them on. Thom’s knowledge of the various cloths is first rate, and the suits do exactly what I asked of them in terms of performance ( I wanted something that I could wear without worrying about, and that would lose any wrinkles and creases easily, which they do). I think the pricing is pretty good too. Their MTM block is the kind of thing I would go for any way, and is really flattering. They are pretty flexible, and most importantly, Thom was happy to make minor adjustments a few weeks after I’d taken delivery – things like slightly cleaning up the chest and letting one of the jackets out. All done with no fuss, and perfect afterwards. Honestly, I couldn’t recommend them enough, and they are a delight to deal with. Go for it! Thom Sweeney are part of the movement of independent boutiques that are helping to turn Mayfair into a destination shopping area. Where better to fall into as you fall out of Claridges or The Connaught. A wonderful shop/atelier and a couple of great blokes…well worth the visit.